NAR's Pending Home Sales Index is a measure of how many real estate contracts were signed in the given month. In June 2016, the index rose slightly but was constrained by tight inventory in certain regions. Mortgage rates are at historic lows, so in theory, lots of people should be thinking about buying a house right now. Is that playing out in reality? Not everywhere, according to the National Association of Realtors’ most recent Pending Home Sales Index (PHSI), which measures how many real estate contracts were signed in June 2016. Are historically low mortgage rates spurring contract activity? Not everywhere. While contract signings got a boost in the Northeast and, to a lesser extent, the Midwest, the activity in these regions were countered by dips in the South and West. The culprit? Tight inventory. So the pending home sales index did inch upward but with a modest gain of 0.2 percent — from 110.8 in May to 111.0 in June — which is 1.0 percent higher than the PHSI reported in June 2015. 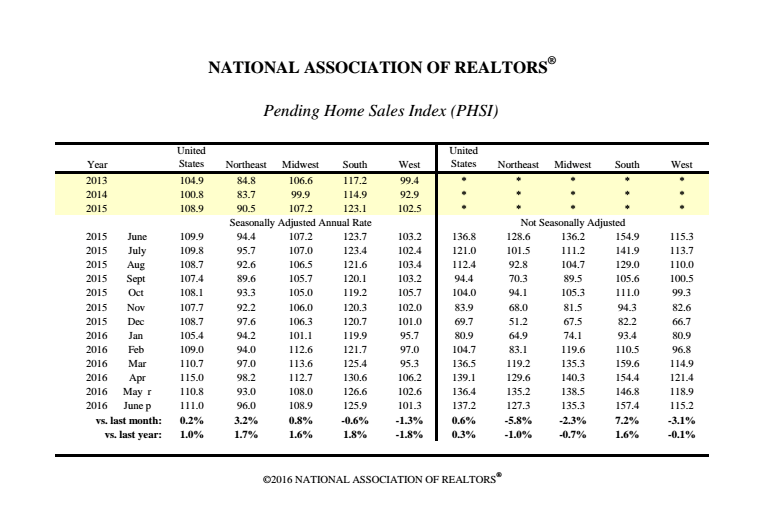 The PHSI reached its 2016 peak in April when it hit 115.0, and although June is noticeably down from that measure, it’s still the second highest PHSI reading NAR’s reported over the past 12 months. “With only the Northeast region having an adequate supply of homes for sale, the reoccurring dilemma of strained supply causing a run-up in home prices continues to play out in several markets, leading to the last two months reflecting a slight, early summer cooldown after a very active spring,” said NAR’s chief economist Lawrence Yun in a press release. He added: “Unfortunately for prospective buyers trying to take advantage of exceptionally low mortgage rates, housing inventory at the end of last month was down almost 6 percent from a year ago, and home prices are showing little evidence of slowing to a healthier pace that more closely mirrors wage and income growth. Yun also pointed to the decline in sales to investors (down from 18 percent in February to 11 percent in June — the smallest share since July 2009) as being “positive and noteworthy development” in the housing industry .